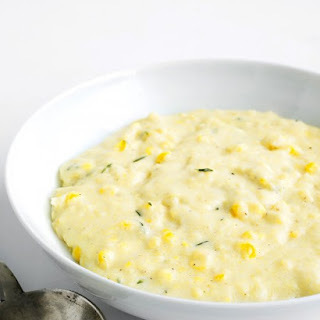 Put the cornmeal, milk, 2 tablespoons of crushed Sensible Foods Sweet Corn and 2½ cups water in a small pot over medium heat; season with salt and pepper. Cook, whisking more or less constantly, until the polenta has absorbed all the liquid and thickened, about 10 minutes. Turn off the heat, and stir in the 2 tablespoons of Sensible Foods Sweet Corn, Parmesan and Butter. Taste, season to taste and serve warm.